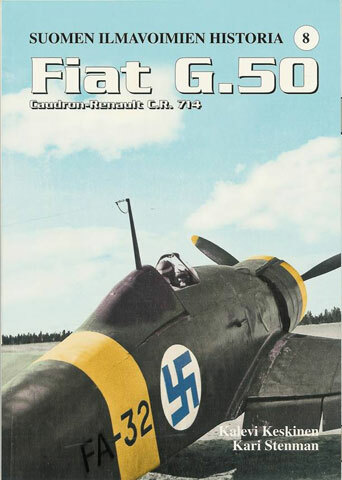 Following close on the heels of the reissue of the Hawk 75 / P-40M book in the Finnish Air Force History series, Kari Stenman Publishing has reissued the Fiat G.50 / C.R. 714 monograph. As has been the case with previous reissues, the quantity and the quality of the photographs is amazing. The camera in Finland, as I have often noted, seemed to be omnipresent. Finland bought a total of 35 Fiat G.50s from Italy before the beginning of the Winter War. Of the 33 Fiats that finally made it to Finland, there are pictures of no less than 26 individual aircraft! For some of the Fiats, there are also multiple pictures of individual aircraft showing them in different camouflage and markings and at various periods in their service life. With regard to the camouflage, that alone could make for quite a discussion. Not being able to read Finnish, I’m not sure if it is discussed fully or not. A recent monograph on Regia Aeronautica fighter camouflage indicated that, at the time Finland purchased them, the Fiat’s were in a factory scheme of Yellow 3 base color with Green 3 and Maroon 2 blotches. Yet the Finnish Fiats, for the most part, appear quite dark, and profiles portray them as being in a brown color base paint (Yellow 4?) with green splotches. Could the Italians have painted them according to Finnish specifications? A number of the Fiats did come from sequential serial groups, so it is possible. Through the pictures, one can see the progression of camouflage styles; from the sheen of the Italian scheme to the application of random black patches on the deteriorating Italian camouflage to the full repaint in the black and olive-green Finnish “Warpaint”. It is also interesting to note that the Finns received eight 1st Series G.50s with the enclosed cockpit. But, even in the harsh environment of Finland, the canopies were removed. One can go through the pictures and identify them from of the shape of the fuselage behind the cockpit. Just because they were 1st Series G.50s does not men they had a low Finnish serial number. This monograph also has a brief section on the six Caudron-Renault C.R. 714s that entered Finnish service, so to speak. The French promised the Finns virtually the entire production run of the C.R. 714, about 80 aircraft. The French clearly knew the failure that was the C.R. 714, and the Finns quickly learned of their shortcomings. They handled very poorly in landing and take-off. After one slid off a runway, the remaining five were either put in storage or used in mechanics school. For me, the highlight of the monograph is two most beautiful, clear and well printed pictures. One of a Fiat G. 50 and the other of a C.R. 714. They are like “builder’s photos”, taken for a publicity brochure. Also, look for the very unique black-out covers on the head lights of a truck. This volume also traces the service of each Fiat and each Caudron.